Technical data Explosion-proof marks: Exde Ⅱ CT6 Gb/DIPA20TA, T6 • protection grade: IP66 • rated working voltage: A.C.380V; 220 v d.c. • rated working current: 10A,16A • use category: ac-15, dc-13 • cable outer diameter • nominal caliber: g3/4,G1 • corrosion protection grade: WF2 Product features • the shell is made of glass fiber reinforced unsaturated polyester resin, with beautiful appearance, corrosion resistance, static resistance, impact resistance and thermal stability. 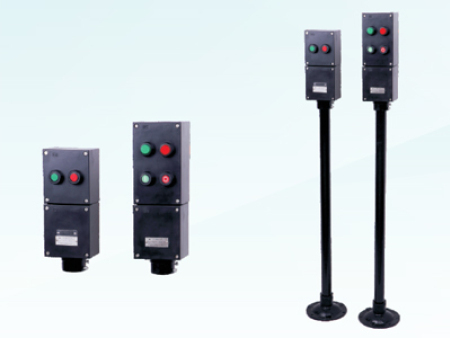 • the product is equipped with explosion-proof elements inside the security type enclosure; • built-in indicator light, button, universal switch, ammeter, voltmeter, etc., other instruments can be equipped as required by the user; • built-in flameproof control switch has compact structure, high reliability, small size, strong on-off ability, long life and a variety of functions for users to choose; • interior explosion-proof buttons adopt adhesive technology, which ensures reliable combination strength; • interior explosion proof indicator light adopts special design; Ac 220V/380V universal; • the combination face adopts curved sealing structure, with strong waterproof and dustproof performance; • all the exposed fasteners are made of stainless steel and designed with anti-dropping design, which is convenient for users to install and maintain. • pipe or cable wiring.